I picked this up at All About Yarn at their sale this past February. I considered a Clapotis, but since the Tess Ribbon one languished for so long, I probably shouldn’t. Now I just need to decide what I AM doing with it. But it’s so pretty I almost don’t care. 15 comments to Sparkly Pr0n! Didn’t Cristi do a clap with her Blue Heron? It would look prettttty…..you know you wanna! Can’t wait to see what you decide on. I have some of that!! I am making my clap out of it. It is the “Cactus” colorway 🙂 green with a touch of purple….. I love that sutff!!! I have some of this too! If you figure out what to do with it let me know – because I have no idea!! OMG its gorgeous!!! Must not look at that yarn!!! 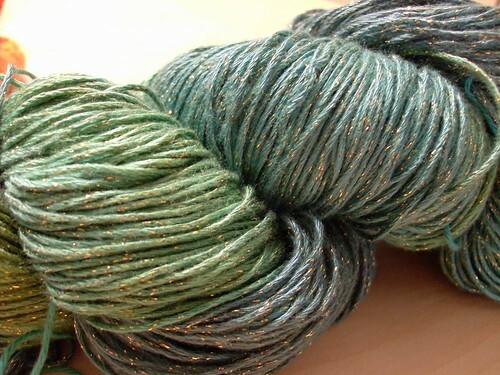 No money to spend right now on yarn,, must resist!! That is unless someone wants to throw some my way, lol. Nah, but really that would make an aweson Clap! But! How was Sea Socks!!!??? 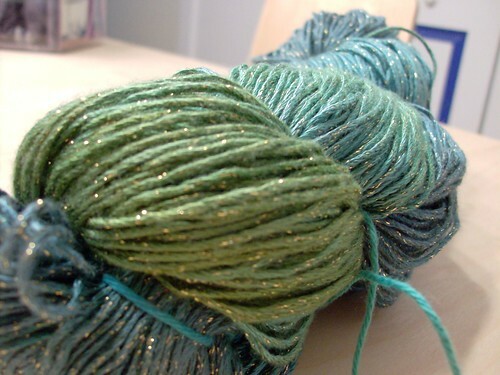 Oooo….Sparkly Clapotis would be so pretty! 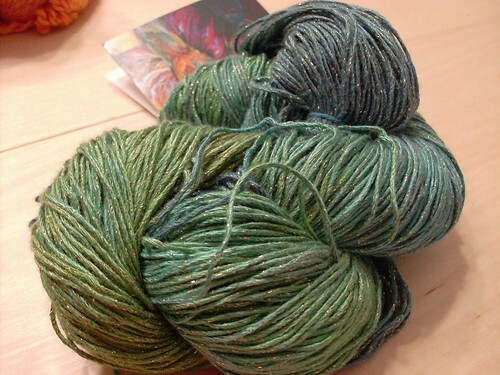 That is some of the most beautiful yarns I’ve ever seen in my life. I’m serious. Someone in my knitting group at work is making that lacy wrap thingie from the new IK using that SAME YARN SAME COLORWAY!!! it’s working up nice.